Bee removal should always be left to our experienced professionals. 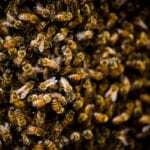 Bee Removal in Miami – Not only can bees on your property be a nuisance that stresses you out, they can also pose a threat to health and safety, and some species can cause significant damage to your home. 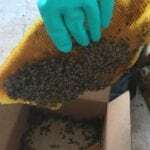 Here at Florida Bee Removal we offer bee removal services using proven bee control methods that are effective yet safe for your family and pets. For our bee removal services, we start by inspecting your property, which includes locating where the bees are residing and determining the species. We provide you with a free bee control assessment and our bee management professionals provide you with a recommended course of action. We utilize advanced industry technology for the safety of your family and the preservation of endangered bee species. Bee relocation is possible in situations where the reduction of a bee population should be avoided. It is always best to call us if you are experiencing a bee problem because there are bee swarms that can be quite aggressive and dangerous. 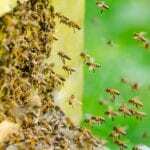 Taking a swarm on yourself can be life threatening and potentially harmful. Bees going indoors happens more often than you might realize and if it happens to you, take advantage of our 24-hour response services for bee removal. We deal with roughly 300 to 400 bee removal situations each month, and as the first provider in the state to offer this service, you are assured of the best results possible. Call today with any questions you may have or to schedule bee removal and/or relocation services.